Current Ultraman world champion, Mike Le Roux from Cairns has taken out the 2011 Glasshouse 100 miler to become the first Ultraman to win a 100 mile ultra marathon. In the process, Mike has also smashed the previous course record with a time of 15:38 beating the old course record held by previous four-time winner, Dave Waugh by just under an hour. It was a battle of Mike and the three Dave’s for much of the day as Mike and Dave Waugh went head to head over the first 120kms of the race. Dave led for much of the first 100kms, but as the guys moved into basecamp at 110kms, Mike started to show his strength and endurance by pulling away from the former course record hold. 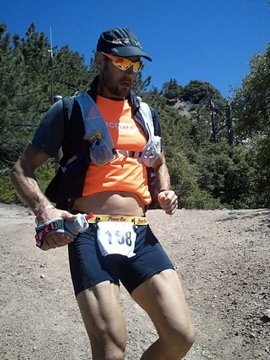 It’s a phenomenal effort from Mike, who has raced three hundred milers this year to date, his most recent being in Los Angeles just five weeks ago in the Angeles Crest 100 miler, finishing in a time of 27hrs 24mins. Mike comes from a triathlon background, but looks set to take the 100 mile scene in Australia by storm if he continues to try his had at this distance. Dave Waugh finished in second place with a huge effort of 15hr 59mins and 41 seconds, sprinting for a sub 16hr finish and smashing his course pb by over 30mins too. In the ladies race, Canberra athlete Pam Muston, the ladies winner last year repeated her victory once again with a time of 22hrs and 30mins. It seems that such a quality field this year has pushed the guys really hard and the results speak for themselves, with numerous people getting under the magic 24 hour mark, and plenty of PB’s too boot in the results too. In the 100km sprint version, Oli Zambon smashed all before him with a rip-roaring time of 9hrs 13mins to take out first place by over an hour. That’s an incredible 5min 36sec per km pace for the whole 100kms, and I believe is also a new record for the 100km event up at Glasshouse too. I am not surprised Mike could become a dominant performer on the Ultra circuit when you see how he tore up the Ultraman World Champs in Hawaii last year. A double IronMan is pretty special and to be th best in the world is awesome. Congatulations on an impressive performance. Awesome run – about 10.3km/hr avg for the duration, though in reality obviously faster because if checkpoints etc. – killer running!! But the results also raise a question – is 4 sets of handholding too much for one ultra, especially with only 41 entrants? At 2 runners per handhold, that’s almost a 20% handholding rate. That would be like seeing 150+ runners hold hands across the finish line at North Face, and that is all f*cked up! Great run Pam Muston too, and Mal, Rob M, Brick, Gordi, Spud, everyone really. But yes, question – handhelds, do they upset your bladder? Sorry for the late response Hokaau, but there were a further 26 runners, 2 of whom had ‘unofficial finishes’ (finished after the cut-off) with 24 DNF’s. Sensational run Mike. Still trying to fathom how you ran the time you did.